Telling personal anecdotes with infectious enthusiasm and disclosing startling and delightful discoveries, Dr. Bargh takes the reader into his labs at New York University and Yale where he and his colleagues have discovered how the unconscious guides our behavior, goals, and motivations in areas like race relations, parenting, business, consumer behavior, and addiction. He reveals what science now knows about the pervasive influence of the unconscious mind in who we choose to date or vote for, what we buy, where we live, how we perform on tests and in job interviews, and much more. 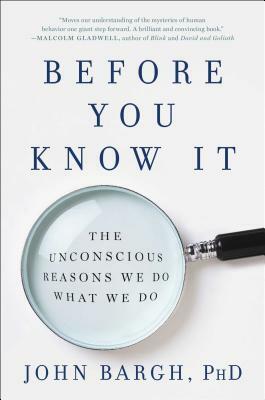 Because the unconscious works in ways we are completely unaware of, Before You Know It is full of surprising and entertaining revelations as well as tricks to help you remember to-do items, shop smarter, and sleep better. Destined to be a bestseller, Before You Know It is an intimate introduction to a fabulous world only recently discovered, the world that exists below the surface of your awareness and yet is the key to knowing yourself and unlocking new ways of thinking, feeling, and behaving. "Although the work is girded with years of studies and research, humor and use of personal anecdotes keep the writing accessible. Readers will finish the final chapter...with new understanding of the authority of the unconscious but also armed with practical tips, based on that knowledge, to use free will to change themselves. Readers of Angela Duckworth's Grit: The Power of Passion and Perseverance or Malcolm Gladwell's Blink: The Power of Thinking Without Thinking will definitely want to read this, as will anyone seriously interested in psychology and self-improvement. Highly recommended."